This is a little Windows tool that lets you maintain different mod setups or versions in distinct folders (stored under 'profiles' in the directory the tool is run from). It leaves whatever's in the existing default Minecraft installation untouched and runs the game directly from the profile folders without copying to the main Appdata folder; the whole setup is portable and can be placed directly on a USB stick if you want and run directly from there. Just drop the Minecraft.exe in the Profile Manager folder and run the Manager. I made this for some people at another board I frequent and figured that it might be of use here. It's Java based, so presumably anyone running Minecraft should have no problem with that. E-mail any bugs to me at [email protected] or post here and I'll update it. Can you make this for mac? Great tool, is there any way to be able to have spaces in the profile names? "javaw -Xmx2048m -Xms2048m -jar "C:\Users\******\minecraft.exe"
but I don't know how that would work for this program. Any help please? It says it encountered a problem and so it never launches? How about a version of this for servers? That'd be wonderful. Why can't Linux have nice things like this? I guess I can figure out a script or something that can pull this off. I'll let you all know if I get something working. im having a bit of a problom, and i think it might have to do with my os. when i first downloaded this, i was using my friends windows 7 laptop. it worked like magic. now im back at my place with an up to date gaming pc that has only 1 real draw back. its using xp. this has never been a problom before, but now it might be, because when i try using the profile manager on here, 2 things happen. 1: it gives me an error message. 2: the exe symbol dosnt appear. Can you add a way to automatically update LWJGL in your profiles? Can you make it so you can have spaces in profile names? Can you add a way to overwrite an existing profile with another one? Can you make it so it will automatically delte meta-inf when you create a new profile? Can you add a way to create a "exact jar mode?" it will always make 2 or more profiles connect have the exact same jar but won't update the mods folder. Can you make it so when you add the minecraft.exe to the folder, and run the program, on first run it will automatically create the profile "Main?" 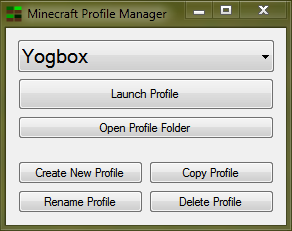 Can you make it so the options.txt, lastlogin file, and the texture-packs folder in the "Main" profile are always copyed to each new profile? I like all these suggestions, could you also make it possible to have a base jar that each profile is made from? This way you can patch one jar for HD texture packs and then all new created profiles would already be patched for HD textures as well. This would also save time if you like to have a particular mod on all profiles. It does not seem to work with Windows XP which frankly is a huge, huge issue. If this supported extended memory i would use it, also its not hard to make it use extended memory, just make it launch a .bat file instead of the minecraft.exe, its slightly more dirty but works. I think it does run a .bat -- it came with a batch file at any rate, I modified it and am just using that instead of the exe. (So I basically am still using the program, just through the command line) I don't remember what the file is called, but it was packaged with everything else. I'm having problems with this program. I'm trying to use 3 profiles.. I install the mods manually, and also use MCPatcher. Once I try changing Texture Pack to Battosay's Texture Pack (for BTW), it black screens and I am forced to close Minecraft. When I re-open it, it has the new texture pack applied, so I try to create a new world. If I try importing an old world from %APPDATA%\.minecraft\saves it still black screens. 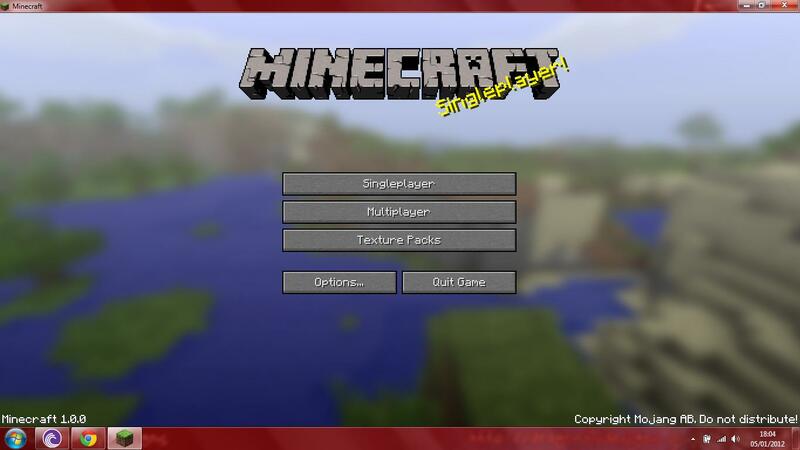 (I have 64 bit java, but for some reason Minecraft gives me the error message when I'm running Far render distance. the issue is it probably runs out of ram. there is no easy fix for this i myself made a custom minecraft.exe that launches a batch file that launches minecraft with more memory but the issue is that i have not tested it out of my system and there are other issues with it such as you need. Basically theres no perfect solution so i struck thru the text thats the boring part. thank you so much for thsi, I am doing minecraft LPs and having this makes me able to keep the different mods separated, normally I just store several minecraft.jar files but that fails when I started to use modpacks as they later the entire file. will you be making a mac version?